Sergeant Wolinski and the Great War is the short result of a long exploration of Great War history. The current version is actually a fourth draft. The project began in the mid to late 1980s as a suggestion by my late mother-in-law. 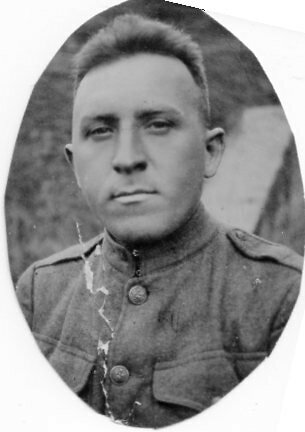 She and her sisters knew that their father Frank Wolinski had served in World War One and had been decorated, but Frank, who lived into his eighties, had never discussed his experiences in France and Germany in any way. He did, however, leave behind a small box of mementos. To his children these were no more than hints of what might have happened. An a​ttempt to retrieve his service records from the U.S. Army revealed only that his records and the records of tens of thousands of other veterans had long since been destroyed in a warehouse fire. The first draft of the Wolinski piece was largely based on the 4th Division’s divisional history, which is one of the more complete divisional histories from the American Expeditionary Force. The gleanings from Frank’s postcards and notebook were essential and I also had some background in generic World War One popular history. Though my own interests were more in the B.E.F., the first draft of the Wolinski piece was a credible if modest effort, not worse than a lot of WW I scratch writing, and I shared it in typewritten form with family. About a dozen years later some of my wife’s cousins asked for copies. I still had a paper version, and considered just Xeroxing it, but I re-read it first and decided to clean it up. The original version contained assertions which, though common to mid-century American historians of the Great War, no longer stood up well. Also, I had stumbled over a considerable amount of old and new material, while researching for the World War One section of Rockfish, that shed light on aspects of Frank's experience. The original Wolinski draft seemed very dated, so I rewrote it somewhat loosely. I am not sure any copies of this draft survive. Many generalities were removed, along with passages that did not reflect the direct experience of the infantry regiments of the A.E.F. 4th Division. Some errors of fact were removed and some additional material was added. The result was about the same length as the first version, but more concise and specific. I still considered this to be a piece for the naïve reader who had no general knowledge of the facts of the war, but did not attempt to fill such gaps. There was also a major unsolved problem, the scale and the nature of the landscape over which the 4th Division operated in the Great War. When my son Alex and I planned our week in northern France in 2015, it was suggested that I could use the opportunity to turn the Wolinski piece into something partisans of World War One studies might actually find worth reading. Initially I rejected this notion. However, we did schedule ourselves a thorough tour of the eastern end of the Argonne Forest battlefield, specifically following the track of Frank’s infantry company. Alex combined GPS with the best period maps and some bumpy farm lane driving to accomplish the complete ground reconnaissance. The actual terrain was a revelation. On return from France I rewrote the piece, amply illustrated it with photos including some very choice “then and now” photo pairs, and published it on Amazon as Frank Wolinski and the Great War. This was quick work and I was finally satisfied enough to consider this project finished.